MB has posted some pics from his August 2014 trip to Sudan in recent posts. For this week’s Foto Friday he gives you one of his favorite pics from that trip. YSL and friends had just taken MB on a tour of a very poor shanty town (maybe not the correct term but MB can not think of better as he types) on the outskirts of Khartoum called Soba. It was then time to smoke some shisha in a nearby shisha hut. MB is not a smoker. Never was. Never will be. But on this occasion, he puffed some shisha with YSL and friends just to be sociable, and thankful for the effort they had all made. The shisha hut was just that. A hut with a frail timber frame and some bamboo leaves (or similar on the outside. And some light paper fabric on the inside. The AC was great! The Middle East gets more bad publicity than good by a long way. And certainly, many locations out here are the victims of religious bigotry, lack or low levels of education, and extreme intolerance. The life of Middle East ladies also comes in for much negative comment, resulting from lifestyles imposed by traditional or religious cultures that seem out of place in the ‘modern’ world. 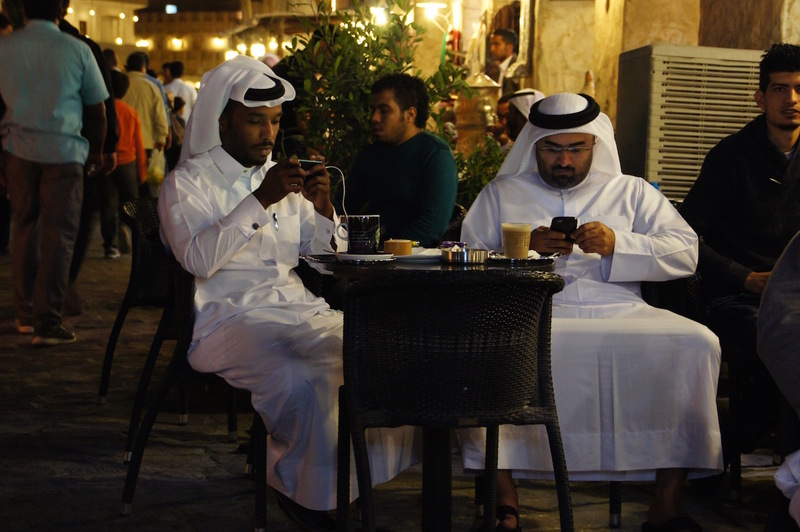 But there are many locations in the Middle East where ladies can enjoy normal social lives outside their homes. Qatar is one such place and the shot of the three ladies below was taken one Friday evening at MB’s local souq. MB knows, by their dress style, that the ladies are not Qatari locals. If they were, they would be wearing full-length head-to-toe black abiya (burka) with or without face-veil (called ‘niqab’ in Arabic). The same is generally true of all ladies who are locals of the Arabian Gulf – UAE, Saudi Arabia, Yemen. So the below three ladies are probably from the Levant or ‘Sham’ (Syria, Jordan, Lebanon, Palestine). One can see designer handbags in the shot, and all three ladies are smoking shisha from shisha water pipes (see the standing pipe next to the lady on the right). Even though more religious Muslims consider shisha, or smoking generally, to be haram (religiously forbidden), you will witness shisha-smoking in almost every restaurant in the entire Middle East, haram or not! All three ladies are also wearing Muslim headscarves (called ‘hijab’ in Arabic), much like our mothers or grandmothers did in the past in Western Europe, as MB likes to remind Westies on occasion. But you will also occasionally see more modern Levant or Arabic North African Muslim ladies not wearing any head cover at all in public. But MB thinks it’s true to say that they are the exception to the general rule. Shisha. The Arabs love it!